Desk plaque for those who serve with metallic gold emblem and unique prayer. On cast resin with the look and feel of handcarved stone; 2" high x 8" wide x 1.25" deep. Prayer message bar includes a prayer on the front and back. 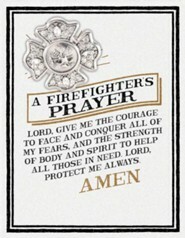 Firefighter's Prayer.."Lord give me the courage to face and conquer all my fears, and the strength of body and spirit to help those in need. Lord protect me always. Amen." 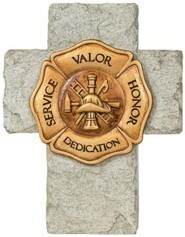 Firefighter's badge. Back As I perform my duty Lord, whatever may be the call, help to guide and keep me safe from dangers big and small. I'm the author/artist and I want to review A Firefighter's Prayer Plaque.